Early tomorrow brings the start of the Second Synod of Bishops for Africa, which Pope Benedict'll formally kick off with Mass in St Peter's. 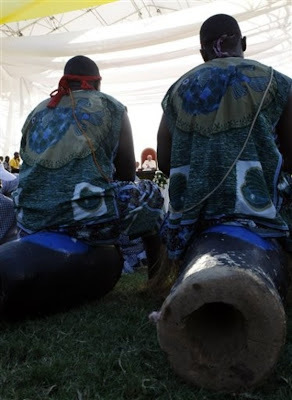 As a curtain-raiser, it's worth noting that the opening liturgy for the monthlong gathering of some 250 African hierarchs will be distinctly different from Day One of the last Vatican meeting on the continent, reflecting the reigning pontiff's emphasis on a liturgical style more in keeping with the Roman rite's roots and, as a result, less inclined toward non-European forms of inculturation. After its preparatory committee protested to John Paul II, the late pontiff overrode his MCs and opened 1994's First African Synod by using the dance-rich Zaire Rite in Michelangelo's basilica. This time around, however, the Launch Mass will have a distinctively more Latinized flavor, opening with the Laudes Regiae (video) -- the traditional litany of the saints reserved for the most solemn papal occasions. While three subsequent hymns and the General Intercessions will be in African languages, the Mass parts (Gloria, Creed, Sanctus, Agnus Dei) are slated to be in the customary Gregorian chant, as is the proclamation of the Gospel; the two prior readings will be in the "colonial languages" of French and English. Of course, the shift highlights one of the keenest points of divergence between pontificates past and present; while John Paul's Masses bore more than ample evidence of a flair for the theatrical (bare-chested performers of both sexes and indigenous instruments included), Benedict's orientation toward a more traditional, refined sense of worship has made for a significant makeover of Vatican liturgy since his 2005 election, and especially following his 2007 appointment of the Genovese Msgr Guido Marini as his lead master of ceremonies. And lastly on this Synod Eve, all eyes remain on the prelate widely tipped to be the "star" of the meeting: the 61 year-old Ghanaian Cardinal Peter Turkson, named the Synod's lead spokesman by B16 in February, and still expected to become the Vatican's lead hand on social teaching following Cardinal Renato Martino's retirement as head of the Pontifical Council for Justice and Peace, a move said to be shortly on-deck.